This airticle is aboot the Balochistan region. For ither uisses, see Balochistan (disambiguation). 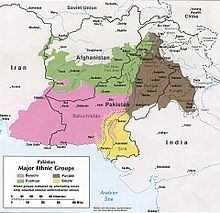 Major ethnic groups o Pakistan in 1980. The pink colour represents the Baloch ethnic group. Balochistan or Baluchistan (Balochi: بلوچستان‎‎, lit. Laund o the Baloch) is an arid desert an muntainous region on the Iranian plateau in sooth-wastren Asie, northwast o the Arabian Sea an the naitional hameland o the Baloch fowk. It stretches athort soothwastren Pakistan, sootheastren Iran, an a smaw section o soothwastren Afghanistan. The soothren pairt o Balochistan is Makran. The seicont maist populous linguistic group in the region is the Pashto-speakin Pashtuns. Brahui is spoken bi the Brahui fowk. Panjabi an Sindhi are spoken as first leids in Pakistani Balochistan an aw an bi Hindki in Afghanistan. Urdu is uised as seicont leid in Pakistan. Persie is uised as a seicont leid in Iran an Afghanistan. Tandon, Pankaj (2006). "New light on the Pāratarājas" (PDF). Numismatic Chronicle. 166. JSTOR 42666407. This page wis last eeditit on 29 Apryle 2016, at 21:29.